Collection of the Artist and in Private Collections. In 1999, as recipient of the Artists to Antarctica Fellowship Award, I traveled to Scott Base and filmed locations where diatoms have been found to survive - the sea ice of McMurdo Sound and the frozen surface of Lake Vanda in the Dry Valleys. I met research scientist Ken Ryan in a field camp in Antarctica, who was documenting the effects of UV light on diatoms, the micro-algae at the beginning of the food chain, that are crucial to the survival of larger life forms. In the following months, Vivienne Cassie Cooper, Waikato based research scientist, and Ken Ryan sent images of the beautiful pennate and centric diatoms that had been processed from Antarctic Core ice samples using an Electron Microscope I used their images to inform my sculpture and decided to exhibit the works in black light to reference the Antarctic UV experiments and the plane journey in darkness. The works were exhibited in ultraviolet light with a video component that included layered Antarctic footage with dissolved, coloured and animated Electron Microscope images. 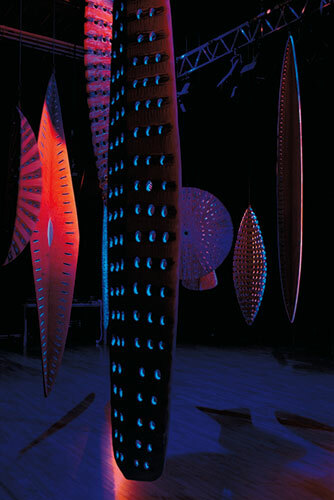 The suspended sculptures were also highlighted with luminescent paint. The soundtrack for the video combined original music by fellow recipient Chris Cree Brown with Weddell seal recordings made using a hydrophone under McMurdo Sound in 1963, by physicist Dr. A C Kibblewhite. The exhibition was supported by Antarctica New Zealand, Creative New Zealand and SONY New Zealand. Dimensions: 21 suspended Artworks varied in height from 800mm-2200mm. 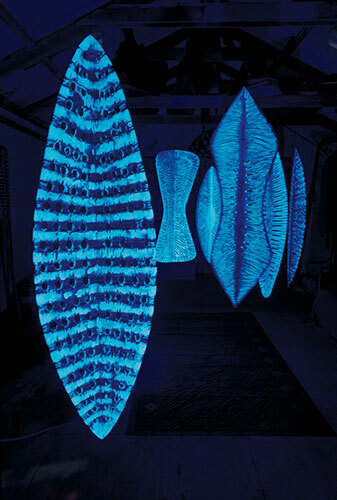 Materials: Macrocarpa, salvaged Totora, acrylic paint, iridescent and luminescent paint.